Greenline Logistics is an international clearing and forwarding company working for a great variety of industries worldwide and especially in Ghana, where it have been established since 1994. With over 20 years experience, the company has innovatively evolved to be a global logistics provider with the vision of providing efficient, integrated total logistics solutions in a sustainable manner in an ever changing global market environment. 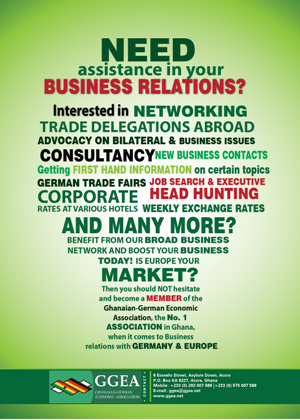 The Ghanaian-German Economic Association (GGEA) is an alliance of Ghanaian and German companies, entrepreneurs, institutions. organisations and individuals with business and commercial interests in the two countries. © 2018 GGEA. All Rights Reserved. Sign-up now - don't miss any update!